For the village in County Armagh, see Belleeks, County Armagh. Belleek (from Irish Béal Leice, meaning 'mouth of the flagstones') is a village and civil parish in County Fermanagh, Northern Ireland. While the greater part of the village lies within County Fermanagh, part of it crosses the border and the River Erne into County Donegal. It lies in the historic barony of Lurg. 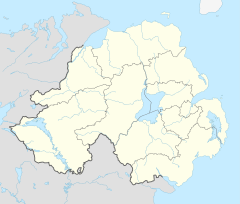 It had a population of 836 people in the 2001 Census, and is situated within Fermanagh and Omagh district. Belleek is a busy market town with a variety of pubs, shops, restaurants and a hotel. It is noted for the fine parian china produced there at the Belleek Pottery, the oldest pottery in Ireland. The china is valued by collectors from all over the world. It is also a noted location for angling and other recreational activities and is now linked to the River Shannon by canal. The highest temperature in Northern Ireland recorded by the Met Office, 30.8 °C (87.4 °F), occurred at Knockarevan (near Belleek) in County Fermanagh on 30 June 1976. The village is the most westerly settlement in Northern Ireland and thus the most westerly settlement in the United Kingdom. The majority of the pottery is still produced in Belleek today using the same procedures of over 160 years. There is evidence of Neolithic settlers in the area, and later legend has it that Fionn mac Cumhail's men sharpened their swords on the big limestone rock at Belleek Falls. (The flagstone, which gave its name to the area, was destroyed together with the falls during drainage works in the 1880s). A castle was built at Caol Uisce near Belleek at the entrance to Lower Lough Erne by Gilbert Costello in 1212. Belleek town in its present layout was founded on the Blennerhassett estate during the Plantation of Ulster in the early 17th century. The establishment of the pottery in 1857 saw the start of growth and the town developed further with the founding of a cooperative creamery in 1899, a police station, a courthouse, post office and dispensary. Located on the border, there were a number of incidents in Belleek during the Troubles – which resulted in eight fatalities between 1972 and 1992. The renowned Belleek Pottery in the centre of the village is currently owned by US-based Dundalk man, George Moore. It was founded in 1857 by John Caldwell Bloomfield, who declared that any piece with the slightest flaw would be destroyed and this is still the case today. The first examples of this fine Parian china were made using kaolin and feldspar deposits found in the lands surrounding Castle Caldwell. With the establishment of the pottery, new houses were built for workers in Rathmore Terrace and in Hawthorn Terrace. There is a visitor's centre at the pottery. A stained glass window featuring a potter's hands is located above the altar in St. Patrick's Roman Catholic church. This was built in 1903 at a cost of £2000. Three stained glass windows were also unveiled in Belleek Church of Ireland in May 2009 to commemorate the founders of Belleek Pottery, John Caldwell Bloomfield, the local landowner, Robert Williams Armstrong, architect, ceramics expert and first manager of Belleek Pottery and David McBirney, Dublin who provided the finance for the project. All were members of the Church of Ireland. Castle Caldwell Forest Walk lies four miles outside Belleek at the western end of Lower Lough Erne. Castle Caldwell was originally built in 1612. Lower Lough Erne is home to various protected wildlife, including inland Sandwich tern, curlew, lapwing, redshank, and snipe colonies. The Royal Society for the Protection of Birds keeps up-to-date records as to colony numbers and well being. Bus Éireann offers routes to Enniskillen and then to major cities and towns in the Republic of Ireland including Cavan and Dublin. Many bus services meet and hopefully connect with each other's timetables in nearby Ballyshannon in County Donegal, where onward connections can be made. Ulsterbus provide limited connections on the longer route via Belcoo to Enniskillen. The Enniskillen and Bundoran Railway served Belleek railway station from 1868 until 1957. The nearest railway station to Belleek is Sligo railway station which is served by trains to Dublin Connolly and is operated by Iarnród Éireann. Belleek Pottery Ltd has long been a major employer in the region, with its visitor centre attracting 150,000 guests per annum. Fermanagh District Council reports that 70% of Belleek Pottery's product is manufactured for export. Belleek also hosts a street mart every third Tuesday of the month, where local crafts and goods can be bought and sold. 4.5% of people aged 16–74 were unemployed. Dr Edward Daly (1933–2016), Roman Catholic Bishop of Derry from 1974 to 1993, was born in Belleek. Samuel B. Horne (1843-1928), a Medal of Honor recipient in the American Civil War, was born in Belleek on 3 March 1843. The civil parish contains the village of Belleek. ^ a b c "Belleek". IreAtlas Townlands Database. Retrieved 5 May 2015. ^ "Northern Ireland". Met Office. Archived from the original on 29 September 2007. "July is normally the warmest month in Northern Ireland, and the highest temperatures of all have occurred inland, furthest away from the cooling influence of the Atlantic. The highest temperature ever recorded in Northern Ireland is 30.8 °C at Knockarevan in County Fermanagh on 30 June 1976, and also at Shaw's Bridge in Belfast on 12 July 1983." ^ John Cunningham (2008). Fermanagh in Sight: The Fermanagh Highlands. Davog Press. p. 17. ISBN 1907530088. ^ "Samuel B. Horne". Archived from the original on July 26, 2014. Retrieved July 19, 2014. Wikivoyage has a travel guide for Belleek. This page was last edited on 21 October 2018, at 14:03 (UTC).